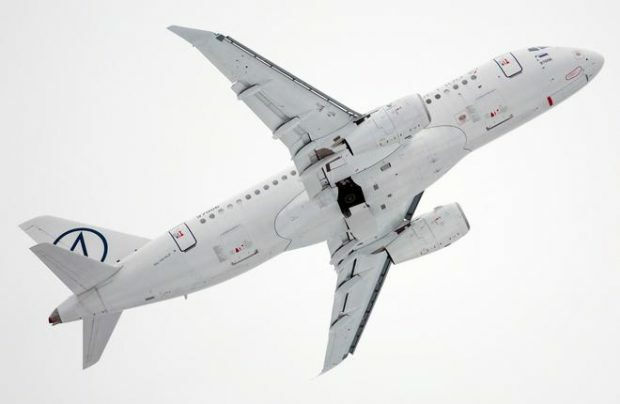 Russian-made Sukhoi Superjet 100 (SSJ100) regional jet equipped with winglets made its first flight on December 21 in Zhukovsky. The test aircraft with s. n. 95032 flew for 2 h 42 min and climbed to altitude of 11,000 m, the aircraft’s manufacturer Sukhoi Civil Aircraft Company (SCAC) reports. The pilots assessed the aircraft’s stability and controllability in different wing configurations. Tests were also conducted to measure fuel consumption at different stages and flight modes. Sabre-like wingtips fitted on the SSJ100 are dubbed saberlets and the result of research, engineering and experimental works SCAC conducted jointly with Central Aerohydrodynamic Institute (TsAGI). The winglets are produced by Voronezh Aircraft Building Corporation. SCAC calculated that they may save SSJ100 operators up to 5 million rubles (some $90,000) per aircraft annually. SCAC reported that the SSJ100’s wing console had been tested for winglets past summer. In November the manufacturer revealed that the winglets were undergoing ground tests. The company claims that in addition to saving fuel the winglets will improve the aircraft’s runway performance and controllability. They may be installed on new aircraft or as a retrofit to the fleet in operation.